We showed you, just a few minutes ago, how a U.S. anti-war protester who could not find a soldier, took an axe to a Dutch student instead to take out his frustration. They break the law, they deface Veteran memorials, they take pride in getting arrested. This isn’t the first time they have sunk to new lows, as Lew from Right in a Left World has just reminded me, via email. But don’t question their patriotism. These are the folks that get the attention. These are the people that get the coverage. This is what the anti-war movement has become. Over the last couple weeks we have shown some despicable actions from the anti-war protesters, defacing monuments and memorials, breaking the law and getting arrested and yet the pro-troops and pro-mission rallies go off without a hitch. No violence, no breaking laws, no getting arrested. Hat Tip to Move America Forward for the latest sickness shown from the anti-war protesters. Disturbed anti-war protester can’t find soldier, kills civilian student with an axe instead. AMSTERDAM, Netherlands (AP) – A U.S. citizen has confessed to using an axe to kill a Dutch student after failing to find a soldier to attack, his lawyer said Tuesday. The suspect, Carlos Hartmann, 41, of Tecumseh, Mich., has confessed to the Sept. 8 killing on a train platform in the southern city of Roosendaal, defence lawyer Peter Gremmen said. 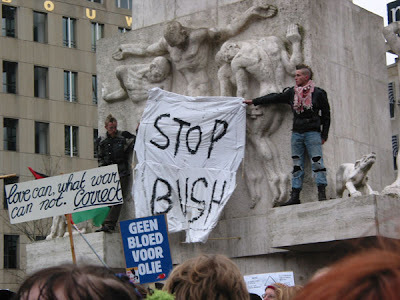 Gremmen said Hartmann wanted to punish the Netherlands for its support of the war in Iraq. Hartmann appeared before a judge Tuesday and was ordered held for another two weeks for investigation. “He hates soldiers, and says that the army kills people, so it would be legitimate if he were also to kill someone . . . from the American military – or from its NATO allies,” Gremmen said in a telephone interview. When he failed to find a soldier at the Roosendaal train station, “he got such a crazy, disturbed idea that he killed a civilian,” Gremmen said. Hartmann did not attempt to escape and was arrested shortly after the killing. Dutch prosecutors confirmed that the suspect had confessed but did not identify him or his victim, in keeping with Dutch practice. Under the Dutch legal system, Hartmann was not required to enter a plea Tuesday. Prosecution spokeswoman Martine Pilaar said her office was taken aback by the defence lawyer’s willingness to disclose details of his case. But Gremmen said he was only confirming details published by the local newspaper BN/De Stem. The paper’s source was not named, and police declined to comment. “I was also surprised when I saw the paper; I thought, this must be coming from the investigation,” the lawyer said. Gremmen said Hartmann has lived in the Netherlands since 2002, supporting himself with English editing work for a Japanese company, which he could do by computer, and that he had no fixed address. The victim, identified as Thijs Geers, was waiting for a train and had no connection with the suspect or the military. Online condolence registers in the Netherlands were flooded with messages of sympathy for him and his family. BN/De Stem quoted a witness who asked to remain anonymous as describing Hartmann as striking the victim in the back of the head with the axe. It also quoted an unidentified family member from the United States as saying Hartmann has suffered from emotional problems since his early 20s. Yeah, they support the troops alright. More patriotism from the anti-war crowd can be found here.